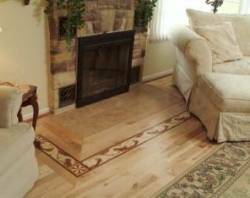 Hardwood borders typically accent the space of the area involved. They help define areas. How & When Are They Installed? 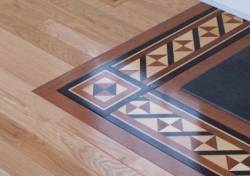 Borders are generally installed during the actual hardwood installation itself. Reasons being there are no templates as there are with medallions. The borders are typically installed first then the hardwood is installed "off" the area. 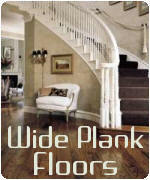 Available are a wide array of hardwood species from all over the world. Shown below are some of the more preferred hardwoods used in the designs. Borders shown on our site are sold in three to four foot lengths. Thicknesses can be specified from 3/8" for engineered floors up to 3/4 inch for solid hardwood flooring. All products are specified to a certain width with some being available for immediate shipping to our warehouse. For other products expect 3-4 weeks to receive. 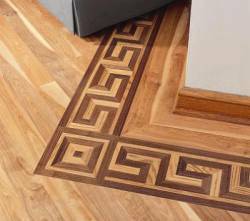 All borders are constructed with a surface veneer of the actual hardwoods themselves. Thicknesses range from 1/8 inch to 5/16" depending on the product manufacturer and overall thickness of the hardwood being used.